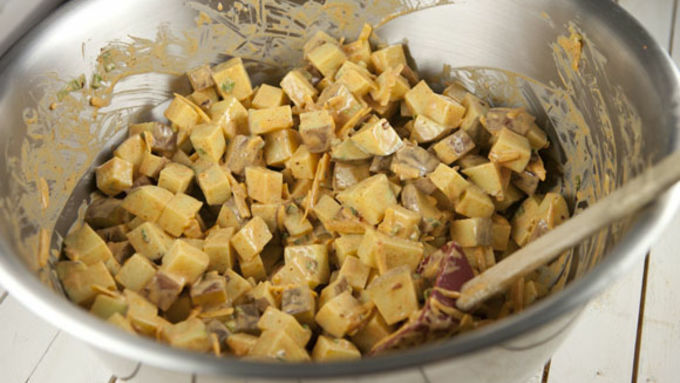 Cube potatoes into 1/2 inch cubes. Preheat oven to 350°F. In a large bowl, stir together ranch, taco seasoning, and half of the cheddar cheese. Add in potatoes and stir well to coat them with the sauce. 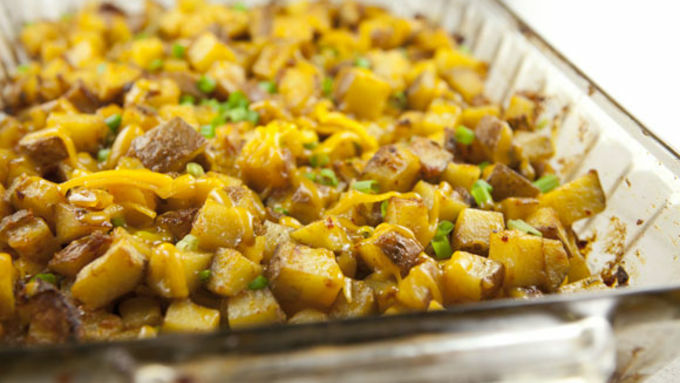 Add potatoes to a large baking dish. Cover the dish with foil and bake them at 350°F for 45 minutes. Remove foil and stir potatoes well. Return to the oven for another 20 minutes or until potatoes are crispy. 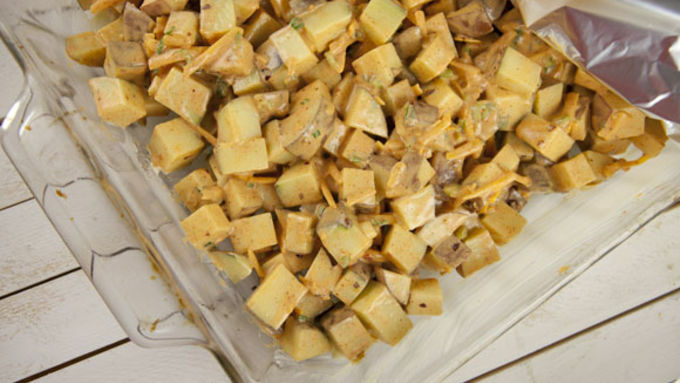 Remove potatoes and sprinkle with other half of cheddar cheese. The heat from the potatoes should melt the cheese. Garnish with chopped scallions and serve immediately! This is one of those recipes that you’ll almost feel bad serving to people because it’s so easy, but SO good. Considering how little work it is, it pays crazy flavor dividends. The only real skill you need to make these Tex-Mex Ranch Potatoes the best thing you’ve eaten all week is a bit of patience. It’s true that they’ll take around an hour to cook, but any good potato is worth the time it takes to get crispy. Most of the flavor in this dish comes from a few simple ingredients. 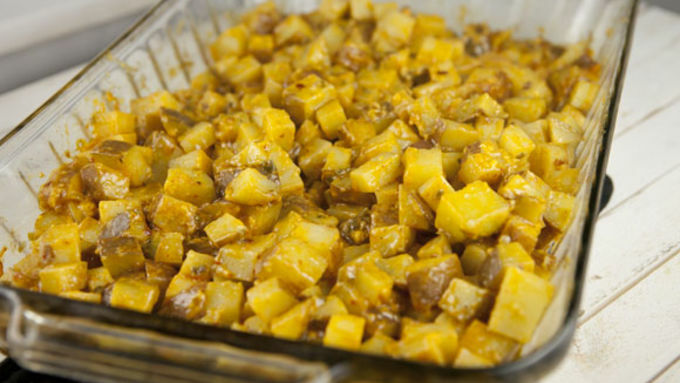 The base sauce that the potatoes get coated in while roasting is just a simple mix of ranch dressing and Old El Paso taco seasoning. I used the hot and spicy variety to give them a little extra kick. 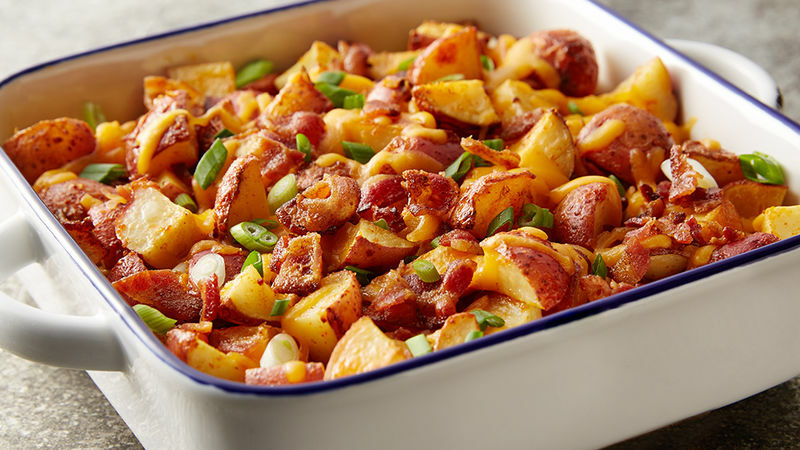 A little over an hour of total cooking time should be enough to have some nice crunchy potatoes, but feel free to bake them longer if you like them super crispy. 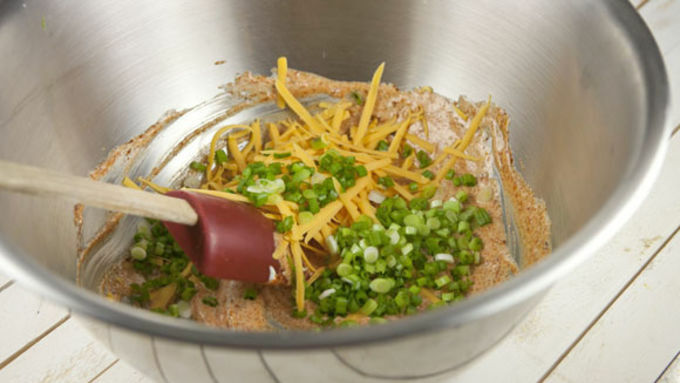 When you’re ready to serve them, sprinkle them with some extra grated cheese and fresh scallions. If you had some crispy bacon lying around, you could toss that into the mix also. The taco plus ranch flavor is pretty amazing and hard not to like!